Nick has worked for Physicians Alternatives, a medical billing company, for the last 10 years. He played two years of basketball at Perry Meridian High School, and enjoys the challenge of improving players on and off court. 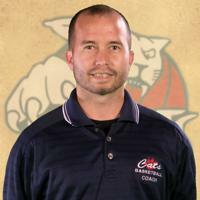 He is in his fifth year of coaching for the Wildcats. Last year, his junior high team finished undefeated, and won the state and regional tournaments. Nick is a proud father of his 15-year-old son, Corey. Their favorite activities include putt-putt, golf, frisbee, games, and watching movies. He attends Harvest Bible Church, in Greenwood, IN. Scot has been involved with youth coaching for over 15 years. 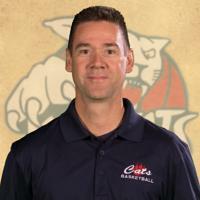 This is Scot’s 2nd season with the Wildcats as a Boys Varsity Assistant and 1st season as the Girl’s Jr. Cats Head Coach. Scot has coached basketball and football for CYO and travel baseball for the Indiana Irish Baseball Club, the Greenwood Stars and Greenwood Little League. Scot has also coached multiple years for the Gathering Place youth basketball program. He is passionate about teaching fundamentals and building character. Scot grew up in NW Indiana where he went to Highland High School and played Varsity Football, Basketball, Wrestling and 4 years of Varsity Golf. After High School Scot went on to get a Mechanical Engineering degree from Purdue University, but more importantly, met his wife Emily there. Scot still enjoys playing golf, softball and basketball. Scot and family attend Holy Rosary Catholic Church, and have four children: Sam (in college), Jake, Sara and Catie (our Wildcats).